Please be our guest as the National Association of the Lycan Brotherhood hosts the seventy-eighth annual Gathering. The biggest event of the social season, the Gathering has become the favorite method of networking among packs and bringing together fated mates. At the Gathering, shifters from across the country show up to show off and to see who's the true leader of the pack. Four stories, three matings, and a homecoming five-hundred years in the making. 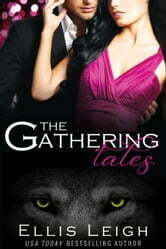 Come and enjoy tales from the biggest shifter event of the year as wolves from around the country fall in lust, in love, and in fate at the Gathering.